Disc springs are often used to compensate for geometric tolerances in component assemblies. On cableways a disc spring stack generates a friction lock between the cable grip and wire cable. Depending on the type of grip, the load can be static or dynamic. We have a wide range of Overload Clutches to suit your budget and requirements. From manually operated machinery to wireless Bluetooth controlled equipment capable of Major Structural Automotive Repairs. In overload clutches, disc springs provide the load required to maintain sufficient friction to transmit torque. The load level can be regulated with adjuster nuts. If overload occurs the transmission of torque is interrupted. 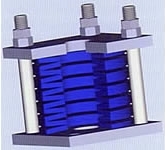 Spring stacks are used for boiler suspension systems. The spring assemblies compensate for localised deflections in the bearing surface and thus guarantee an even lowering of the boiler with load fluctuations due to thermal expansion. The disc spring ensures that the hydraulically actuated piston returns to its original position after the load on the coupling is released. Tolerances and wear on the coupling components are compensated for by the horizontal characteristic of the load curve in the working range of the disc spring. This results in consistent shift quality. 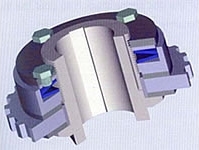 In slip clutches the disc spring provides a defined axial pressure on the friction linings. Wear on the friction linings over the life of the clutch is compensated for by the disc spring, thereby maintaining a constant torque level. Slotted disc springs with a flat load curve are especially well suited to this type of application. The braking load is generated by the disc springs when the hydraulic pressure to a predetermined level. 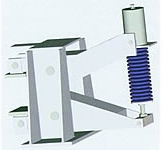 In tool clamping components, the function of the disc spring stack is to hold the tool securely in the tapered holder. In quick-action stop valves the spring stack is hydraulically preloaded when in the open position. If a failures occurs, the hydraulic pressure drops and the disc spring stack is released, closing the valve and thus interrupting the flow. Often ball-centered disc spring stacks are used for this purpose.